Caramel Popsicle Recipe from The Dairy Good Cookbook - Chocolate Chocolate and More! 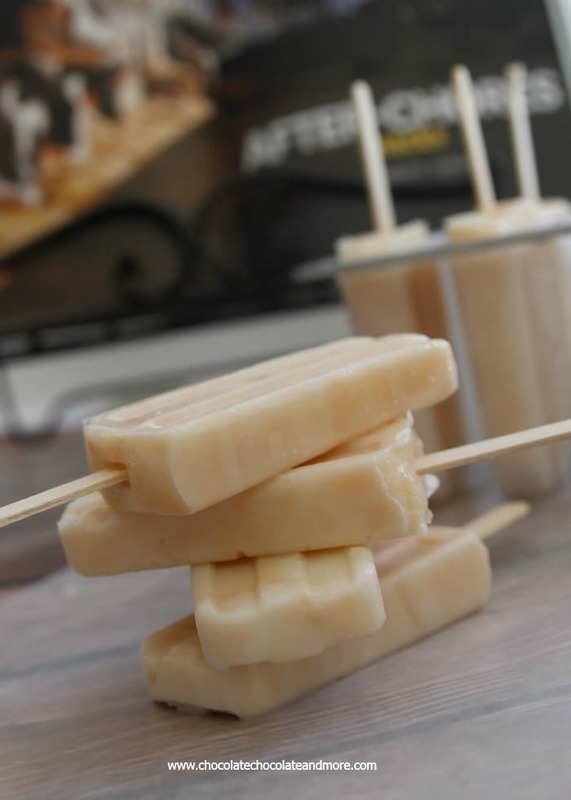 Caramel Popsicle-a simple custard made with milk and sugar is the base for this sweet summer treat! Did you know June is National Dairy Month? My kids go through at least a gallon of milk a day. I always tease them: we should just get a few cows and put them in the back yard. It’s not realistic, I know. We can’t have hooved animals where we live anyway. More than that, it’s a lot of work to raise dairy cows. A Lot. Unlike any other farming, it’s a daily chore. The cows have to be milked every day. There’s no lazy Saturday or Sunday mornings. The cows are waiting. Reading through The Dairy Good Cookbook brought so many memories back for me. You see, my Grandparents had a dairy farm. the family stories, the love of the land, the cows, the products they produce…and the recipes! It’s not just a cookbook, but also a book to read. Milk is just the start: Cheese, Butter, Yogurt, Cream, Sour Cream, Cottage Cheese, Cream Cheese (I can’t imagine eating a bagel without it!) oh, and Ice Cream. We have it all because of these dedicated farmers. 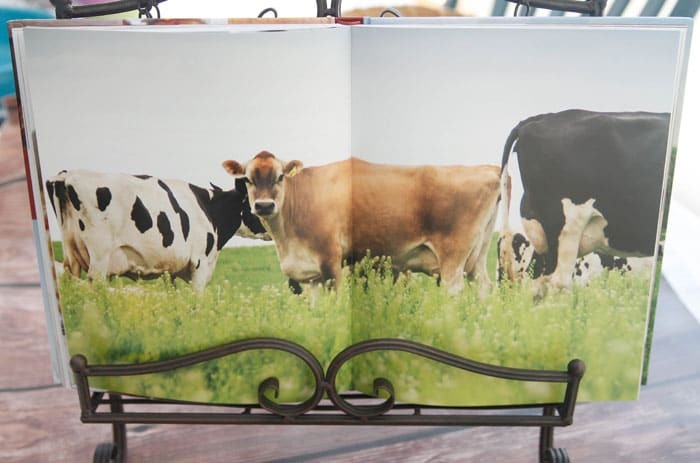 the family stories, the love of the land, the cows, the products they produce…and the recipes! It’s not just a cookbook, but also a book to read. Milk is just the start: Cheese, Butter, Yogurt, Cream, Sour Cream, Cottage Cheese, Cream Cheese (I can’t imagine eating a bagel without it!) oh, and Ice Cream. We have it all because of these dedicated farmers. The Dairy Good Cookbook: Everyday Comfort Food from America’s Dairy Farm Families features over 100 recipes created by and for America’s 47,000 dairy farm families. From Breakfast, Lunch and Dinner, there are also Snacks, Desserts, and Holiday recipes. I can’t wait to make the Fresh Berry Stuffed French Toast with a Vanilla Yogurt Sauce and I know my kids will love the Slow Cooked Beef Stroganoff. Since it’s almost summer (it really feels like it is summer!) I thought I’d share a popsicle recipe from this cookbook. Simple to make, the creamy milk mixture is swirled with caramel sauce. 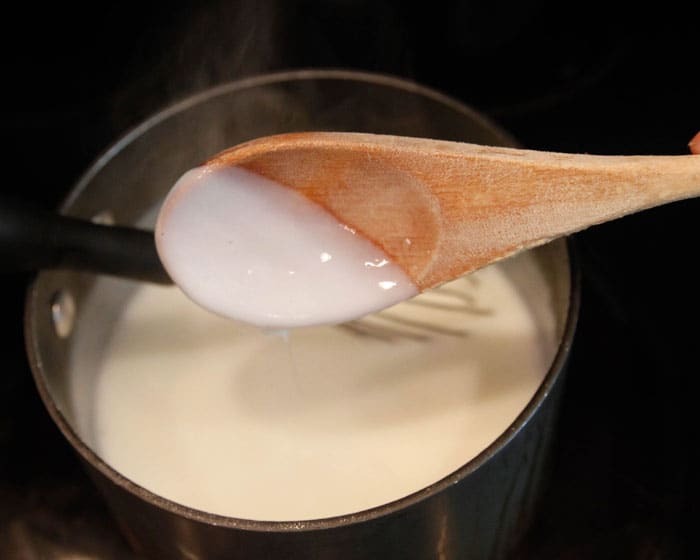 When cooking your milk mixture, you know it’s ready when it sticks to a wooden spoon. To make transferring your swirled mixture to popsicle molds, I prefer using a plastic bag. So much easier than trying to spoon it into those tiny openings. 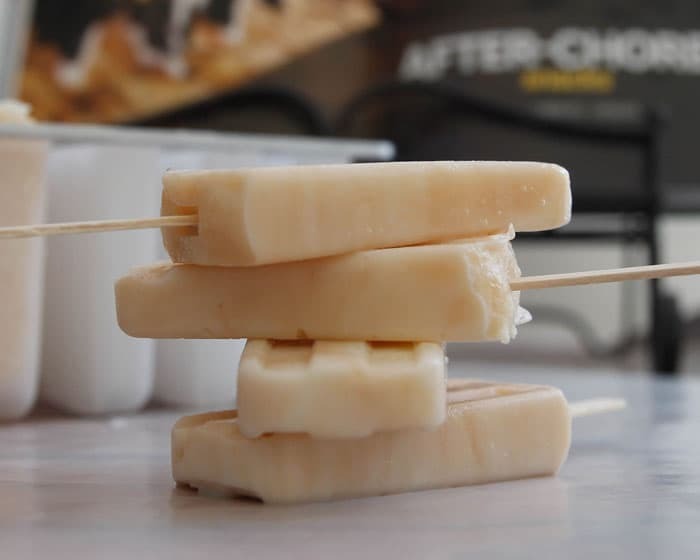 Add your popsicle stick, freeze then enjoy on a hot day. 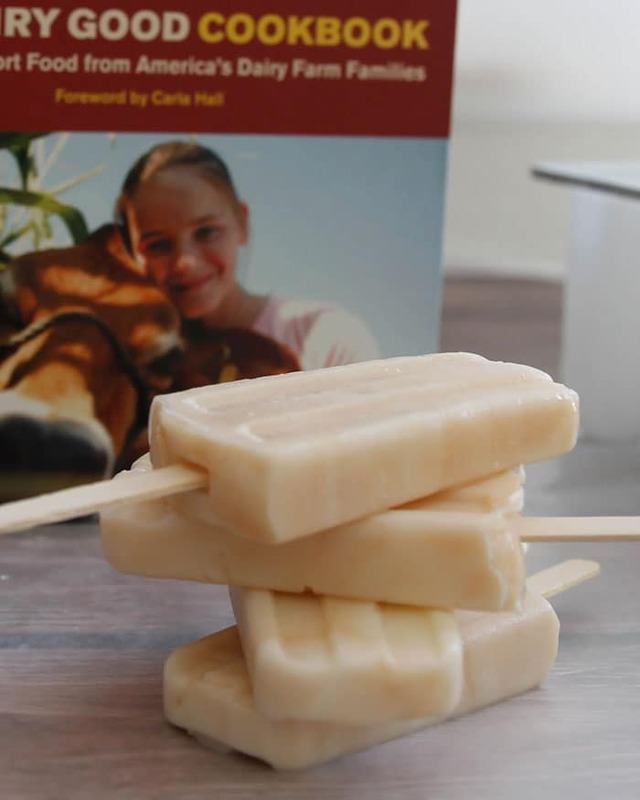 This Caramel Popsicle Recipe appears as Caramelicious Milksicles in The Dairy Good Cookbook on page 124. Combine sugar and cornstarch in a medium saucepan. Over low heat, whisk in milk until combined. Increase heat to medium-high and bring mixture to a boil. Lower heat and simmer for about 2 minutes, until thickened. Transfer to a shallow container or bowl. Cover and chill in the refrigerator for 40 minutes to cool. 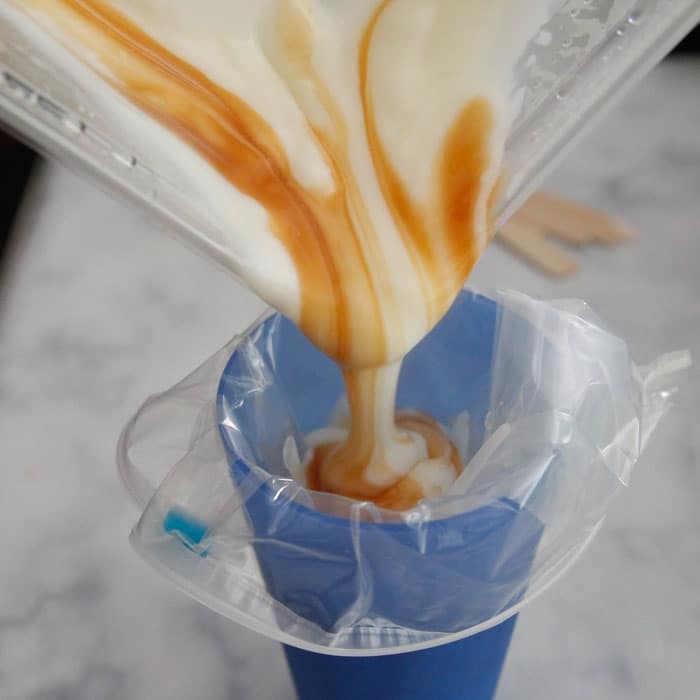 Add caramel topping, placing spoonfuls on top of chilled milk mixture, then lightly swirling with a knife. 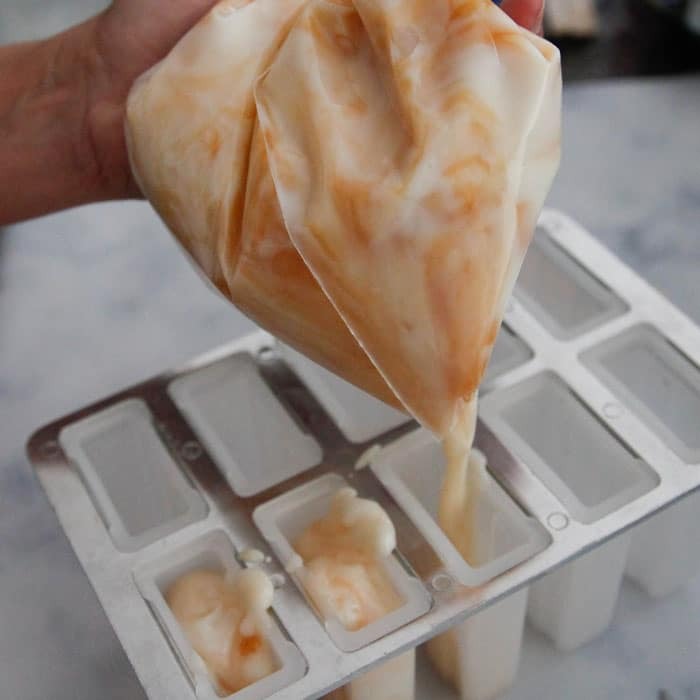 Transfer swirled mixture to popsicle molds and freeze until firm, 4-6 hours or overnight. The perfect “After Chores” treat! 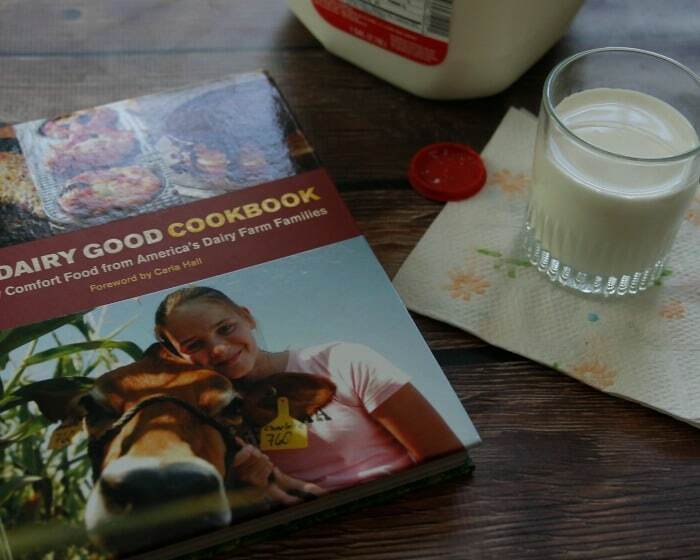 You can find The Dairy Good Cookbook wherever books and e-books are sold – Amazon, Barnes and Noble and Indie Bound. This article is sponsored by Dairy Good. The opinions and text are my own. We make our own homemade ice cream shakes every Sunday in the summer here in Wisconsin. Home made ice cream and home made whipped cream is a terrific comfort food. You always feel super special when someone goes through the trouble making it for you. Growing up, my grandma lived in Georgia and when I was little, the first recipe she taught me to make was cheesy mashed potatoes with whole milk. We make these potatoes every Christmas in honor of her. Over the years, our family has modified the recipe by adding bacon or garlic to the potatoes, but they are still as cheesy as ever. We now call these potatoes Granny Potatoes! 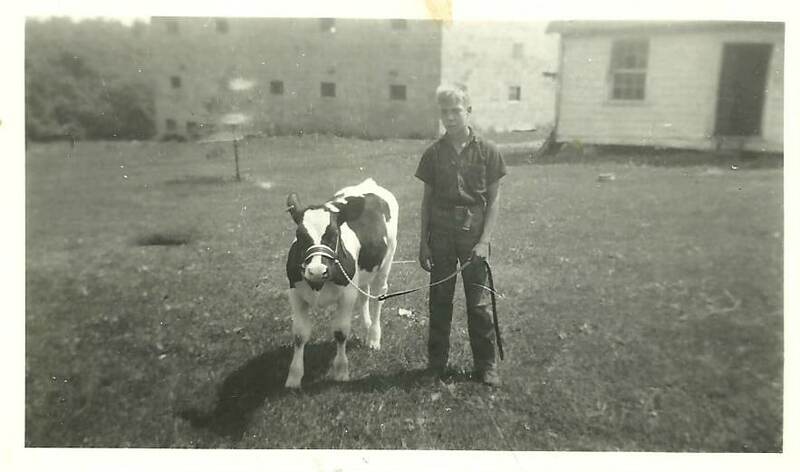 My dad also milked Holsteins years ago. I have quite an appreciation for the whole family working to make the farm work. And, where would we be without all the amazing dairy… This cookbook sounds wonderful! How neat that your grandparents had a dairy farm! What fun! I’m totally in love with these popsicles – caramel is my fave! Ahh, dairy. I love it so much! My great-grandparents also owned a dairy, but it closed before my mom was born, but I have many fond memories of exploring the abandoned barns! My family drinks milk like crazy-we go through a gallon of milk a day too! I adore cheese of (almost) every kind, we like 3 blocks from Rumiano Cheese, our local cheese factory. We frequent it a LOT, sometimes more than twice a week! It’s kind of embarrassing how much dairy we consume! My favorite form though is desert: Cheesecake and ice cream to be specific! We love making potato and cheese pierogies in my family, we make them every holiday, have been since i was a child. I love hearing about your grandparents! Farming is such an incredibly hard job and you are right, there are no lazy days! Thanks for sharing these awesome popsicles! When my husband and I were first married close to 20 years ago he gave me a cookbook as he put it to “save our marriage” I didn’t know how to cook,but was a voracious reader so I read the cookbook all the way through and the first recipe I tried was lasagna which had lots of cheese in it! Well it was an instant hit and I still make it till this day. I just want to ask what mold that is. I’ve been looking for one. I love to make strawberries and cream Popsicles with my sweet boy! While my recipe is very much improvised (blend some cream and condensed milk and strawberries and freeze), I look forward to my trying out this recipe. I bet it will be a hit!! oooooh I so so so want and need these popsicles! so creamy and dreamy and perfect! When I want to do something nice for my hubby, I whip up a chocolate pudding pie. Homemade pudding and a graham cracker crust — easy but he loves it! My mom always made it, too. I make a peanut butter cream pie every holiday, family loves it and looks forward to having it. We always grew tomatoes in the garden and one of mom’s favorite ways to use them was to make cream of tomato soup. I still make it in August and September when local tomatoes or plentiful. It has to be my mother-in-laws homemade macaroni and cheese. Its a hit at holiday dinners. I always enjoy making this dish. Mac and cheese is recipe we all love and will be enjoyed by my children and their children. Mom;s Sweet Vidalia Onion Pie causes awe in its tasters! I made a cherry cheese pie one year for Thanksgiving….now it is a must-have at all family gatherings & friends’ potlucks. One of my fondest memories is making homemade fudge with my mom during Christmas. It was the one time of year she used real butter and sweet cream! LOL She still makes it to this day and every time I take a bite I am a kid again mentally.